Please subscribe by e-mail or rss. Please visit the course page.
" A mandala is...an integrated structure organized around a unifying center." "The flower’s perfume has no form, but it pervades space. Likewise, through a spiral of mandalas formless reality is known." "I saw that everything, all paths I had been following, all steps I had taken, were leading back to a single point — namely, to the mid-point. It became increasingly plain to me that the mandala is the centre. It is the exponent of all paths. It is the path to the centre, to individuation. I knew that in finding the mandala as an expression of the self I had attained what was for me the ultimate." "A useful image to help us conceptualize the thread of personal unfoldment is the mandala. By mandala I mean a field with a midpoint, such as a sphere with a center. The field is the totality of your experience – your thoughts, feelings, sensations, perceptions, actions; it is the totality of your life at each moment.The center is where Being's dynamism touches your field, touches your mandala. This is where the transformation of experience begins, which then ripples through the whole field." "The continual stream of new discovery, revelation and inspiration which arises at every moment is the manifestation of our clarity. We should learn to see everyday life as mandala - the luminous fringes of experience which radiate spontaneously from the empty nature of our being. The aspects of our mandala are the day-to-day objects of our life experience moving in the dance or play of the universe. By this symbolism the inner teacher reveals the profound and ultimate significance of being. Therefore we should be natural and spontaneous, accepting and learning from everything. This enables us to see the ironic and amusing side of events that usually irritate us." 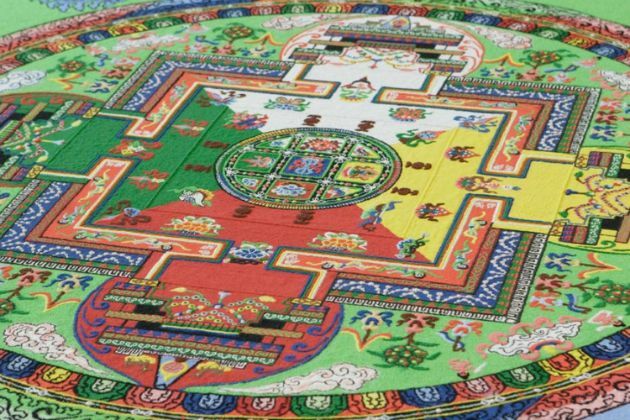 "The tibetan word for mandala is kyilkhor. Kyil means 'center', khor means 'fringe', 'gestalt', 'area around'. ...Things exist interdependently, and that interdependent existence of things happens in the fashion of orderly chaos." Thank you for visiting this blog. If you like what you are receiving here, you can take the next step by signing up for a Free Discovery Session. Please check out upcoming courses. You can also connect on Facebook.